Carpet Cleaning | Woodinville, WA | Continental Carpet Care, Inc.
Continental Carpet Care, Inc. started as a small family-owned business with the mission of providing the best possible carpet cleaning services to Seattle area residents and businesses. Over 26 years later, we're still going strong and have grown to include three divisions in our company: Residential Service, Commercial Services, and Emergency Water Damage Restoration Services to the Eastside. We provide a broad spectrum of residential and commercial carpet cleaning services in the Woodinville, Washington area, including hot water extraction, upholstery cleaning, tile and grout cleaning and water damage restoration services. Continental Carpet Care, Inc. cleans all types of carpet, large and small area rugs and upholstery using high-powered hot water extraction vacuums. At Continental Carpet Care, Inc., we believe that cleaner carpets make your home healthier for your family. CALL to Get Your Discounts! The technicians at Continental Carpet Care are experienced, reliable and trustworthy. Our customers are comfortable in having a Continental Carpet Care technician in their home or office. Continental Carpet Care offers exceptional, superior service at a fair price. We are dedicated to providing you with the best possible carpet and upholstery cleaning in all of King County. When you choose Continental Carpet Care, Inc. to clean your carpets, there will never be any “hidden charges”. Charges are disclosed and confirmed at the onset of the cleaning appointment, leaving you worry-free. At Continental Carpet Care, we feel that it is very important to have a clean environment, inside and out. That is why we provide free cleaning to people who are experiencing hardships, whether financially or medically. When we help someone attain a healthy indoor environment, it makes us feel good. 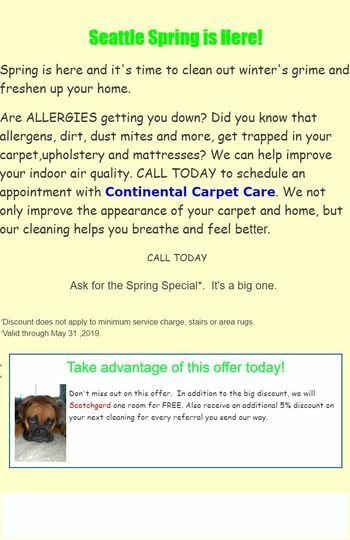 Get your carpeting professionally cleaned by Continental Carpet Care, Inc.: The Eastside's carpet cleaning specialists. We offer residential carpet cleaning for homes, townhouses, and condos in and around Woodinville, WA. Call (425) 559-9995 today for a free quote. From small offices to multi-floor office buildings, Continental Carpet Care, Inc. is fully staffed to provide your company with professional carpet cleaning. Call (425) 559-9995 and ask about our flexible scheduling and maintenance contracts. Experiencing water damage? Continental Carpet Care, Inc. has not only been in the carpet cleaning business for over 30 years, but also in water damage restoration services. Call Continental Carpet Care, Inc. for water damage restoration services in or around Woodinville. Registered in the State of WA as Continental Carpet Care, Inc.